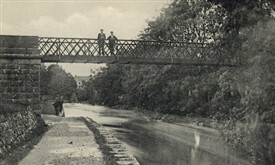 View of Metal Bridge spanning River Rove with the Bower's Lane to left leading up to Main Street. Entrance to Bower's Lane with its right side wall the boundary of the Rectory. 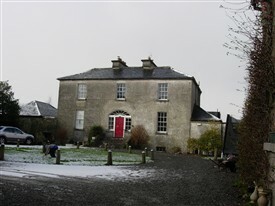 The Rectory for the Church of Ireland, built c 1810 is adjacent to Bower's Lane. 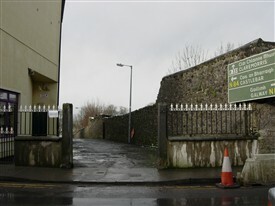 Entrance to Bower's Lane on Main Street. 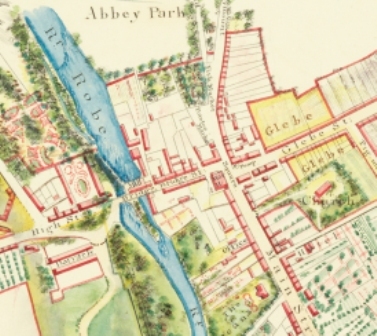 The entrance to Bower’s Lane which leads down a steep incline to one of the metal footbridges over the River Robe is opposite the two Bank buildings. 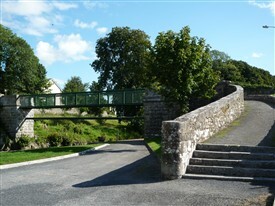 This Bridge in turn leads to the 2 mile, well known walk locally known as the Bower’s Walk. After crossing the metal bridge there are steps down to this walk along the banks of the Robe which at this section had been rebuilt as a canal – see Bower’s Walk. 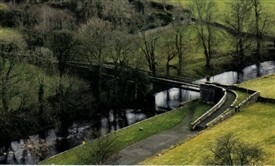 Nearly 40 miles long, the River Robe rises at Brickens near Ballyhaunis in Co Mayo. On its long winding journey it passes Claremorris, through Hollymount and Ballinrobe and drains into Lough Mask just three miles past Ballinrobe and close to Cushlough Bay. Fishing was interrupted on the Robe the 1980’s when the river was drained in parts but recovered well, and one will find a plentiful supply of brown trout, perch, pike and eel. Below is a poem entitled The Ballad of the Bowers which was first published in the 1972 edition of the Bridge Magazine, visit library for copies in the Local History Dept. See them hurry on to mingle, with the world-acclaimed Lough Mask. As they strolled along together in their youthful happy day. The Hill of Life – we had to climb with “the going” sometimes tough. “The memories” of a by-gone day alas, too quickly flown. When I am gone you’ll travel on in never-ending measure. First question I will ask him, will there be – a Bower Walk. Nettie married John McTigue and they ran their supermarket McTigues on Main Street, now Vaughan's Shoe Store. previously Fahy's supermarket. This poem was first published in The Bridge magazine in its 1972 edition. Nattie was a very creative and talented woman winning many prizes for her handcrafts. 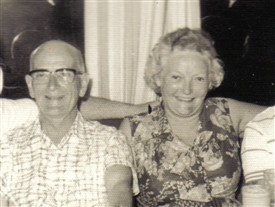 Their two daughters Blanch and Delma still live in Ballinrobe.